[Additional addendum to the late Johnsonian addendum: “John, when I wrote that ‘addendum’ to you, I hadn’t caught the April date you offer for the single entry by O’Hara, in the journal he had with him at the accident (I missed that date in Le Sueur’s book, too!) So my comment there alluding to FO’H writing it during the fateful July sojourn at Fire Island is obviously incorrect. Le Sueur says in his book that the entry “can be regarded as his final lines of poetry,” and I had taken that remark too literally, I see. I’m glad the esteemed poet Tony Towle has written once again about the questions surrounding “Frank O’Hara’s” canonical poem, ‘A True Account of Talking to the Sun at Fire Island.’ As he points out, a book is to be published this fall on the topic, by Richard Owens’s Punch Press (in fine-production release of 100 copies—a larger edition will be done through a trade publisher). Most copies of the first edition have been pre-sold, but a few remain available for order here. I say I’m glad he has written because it provides me an opportunity to reiterate my ripostes to some of his confusions and misunderstandings from two years ago, numerous of which he repeats here. And glad too, for his letter does present a very surprising claim towards its conclusion. I am willing to assume it is true, until shown otherwise. It is a claim that, despite Towle’s intentions, could be seen as reinforcing the hypothesis for Kenneth Koch’s authorship of the famous poem. Let me state from the outset, for my tone in what follows is sometimes direct, that I have the utmost regard for the poetic work of Tony Towle, regardless how he may feel about my own. And though we sharply disagree concerning key points in this topic, I do honor the understandable sense of coterie-protectiveness that compels his arguments, however unsatisfactory I may find them. As in our previous exchange at Isola di Rifiuti, I enter my answers, in bold font, within his letter. I’ve pointed out (and with all due respect) why Bill Berkson’s very anachronistic memory of the “discovery” occasion must be put in skeptical brackets. Berkson reported, here at Isola di Rifiuti, to have been with Koch at the copy machine when the latter pulled a poem from the pile and shouted “Hey, look at this!” Unfortunately, Berkson also assertively dates this episode at “a year or so after Frank died,” long after Koch publicly presented ‘A True Account . . .’ Copying of O’Hara’s work was taking place at that later time, so it does seem likely Berkson is confusing poems, a reasonable slip after forty-some years. In any event, if Koch had written the poem under the sign of O’Hara’s name, why wouldn’t we expect him to say something like that? He certainly would not have said, “Hey, don’t look at this!” I’m afraid it is a non-issue. On the matter of the general reaction after Koch’s famous memorial reading of the poem, that “nobody thought it sounded as if it had not been written by O’Hara,” I can only say, again, that such would hardly be surprising, given the emotion pervading the event and the poem’s strange and moving premonitory cast. Koch revealed it as an unearthed masterpiece by O’Hara. Of course nobody on that night would have thought it wasn’t O’Hara’s voice. But this aside, Towle may want to consider that some very respected critics now feel, as I do, that there is something “off-kilter” about the poem and its companion circumstances: The O’Hara scholar Lytle Shaw, author of the widely admired study (Towle himself admires it) Frank O’Hara: The Poetics of Coterie, agrees there are highly anomalous details in the poem’s history and that these at least justify the raising of hypothetical questions, which is what I have done. Shaw, in fact, has a blurb on my forthcoming book to this effect. 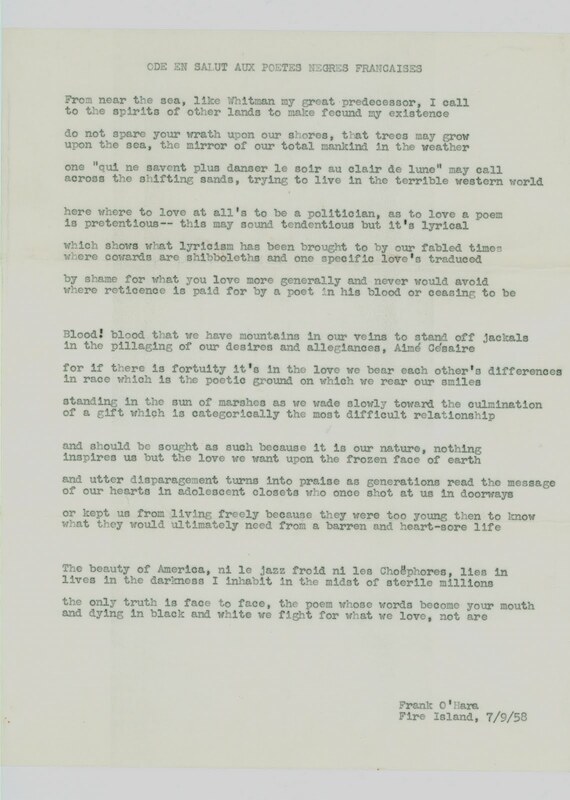 Marjorie Perloff, author of the groundbreaking study Frank O’Hara: Poet among Painters, wrote me shortly after the announcement for A Question Mark above the Sun to say she has herself long doubted the poem is by O’Hara and that the sound of it, “by internal evidence,” is much closer to Koch. And Barry Schwabsky, the noted poetry and art critic for the Nation magazine, has also written me that the poem rings much more like Koch than O’Hara (though Schwabsky is strongly skeptical Koch would have written it without eventually revealing his authorship—a reservation I answer in the introduction to the forthcoming book). So it won’t quite do, more than four decades gone, to appeal to a grief-stricken audience’s reaction upon first hearing the poem. Now, none of that’s to suggest the discussion is primarily a matter of competing “impressions” about voice and tonal registers. These are certainly germane, but settlements concerning attribution often leave the affective side of things in the dust. The major issue, rather, is that the particular poem under consideration has a number of very odd circumstantial things attached to it, and these invite, I believe, added thought, extrapolation, and conjecture. It’s in that spirit that I’m pursuing the topic, “impolite” as the pursuit may seem to some. I’ll leave Mr. Towle to his assumptions regarding my motives. I do hope he will purchase the book and consider some of the specific questions raised in its introductory essay. It’s simply not the case that “a couple musings” by Joe Le Sueur are the basis for the hypothesis. Le Sueur’s head-scratching over the mysteries connected to the poem are certainly intriguing and important to consider (he was O’Hara’s longtime roommate and with the poet on the day the poem was supposedly written), but the whole matter is more involved than that. As I explain in the introduction to the book, it is an absolute mystery why O’Hara would not have shared the Mayakovsky imitation with his closest poet-friends. There are specific reasons offered there for why ‘A True Account . . .’ is a case apart, in regards to its “disappearance” during O’Hara’s life, and in particular during the late-50s period when it was purportedly written. Again, Towle’s rebuttals are unpersuasive. It’s not really a crucial matter, and I am open to correction, but it appears the place where O’Hara and Le Sueur spent the July 1958 weekend (as Le Sueur specifies) was a “beach house” that Fondren and Shaw rented, during summers, at Fire Island Pines, not Fondren’s “house” in Fair Harbor. O’Hara’s reference to “Fairharbor” in the letter, concerning a fanciful future sailboat visit to Fondren, would seem in reference to Fondren’s residence at that location, not to the cottage where he and Le Sueur had recently stayed. Perhaps we can rely on Le Sueur’s rather detailed account. Towle continues here, despite my patient explanations to him two years ago on the matter, to get this completely wrong. As I had stated, the invented status of Motokiyu’s collaborators had been prominently announced and widely known long before the tape-essay’s appearance in Almost Island. In fact, precisely this is noted beneath the tape-essay itself, as it had been thirteen years ago, in the Appendix material of Doubled Flowering: From the Notebooks of Araki Yasusada. It is thus quite conspicuous that the tape-essay is a critical-fictional performance, wherein certain imaginative liberties are naturally present, much as they are in the four pseudo-critical essays I wrote on the O’Hara mystery for the Chicago Review, which also appear in the book. Towle, unfortunately, has read the tape-essay as a conventionally earnest document, rather than as a hybrid-genre experiment candidly offering measures of fancy. A collection of writings by various authors (Chrysanthemums and Scuba Divers: Essays on Araki Yasusada) will be published next year in England. Towles’ confusions (he goes on at some distressed length about Yasusada and Motokiyu below) might be partially remedied by reading that book. Regardless, almost all the commentary by Le Sueur in the tape-essay (the invented portions are of mostly non-substantive kind) appears verbatim in his Digressions on Some Poems by Frank O’Hara. One is surprised to have to repeat this again. Numerous paragraphs and quotations following here by Towle offer somewhat comically pedantic “corrections” that stem from his simple misunderstanding of the tape-essay’s nature; as such, they are irrelevant to the larger issue, and I pass them over without comment. All of the above “close-reading” attempts by Towle to prove the fictional nature of the tape-essay have, as I’ve said, absolutely no bearing on the case. On the question of the typewriter, see below. Jaffe told me he’d attempted, after my inquiries, to confirm through outside expertise that the paper-bond run on both poems was of 1958 or prior issue, but that he’d been unable to get conclusive results. Obviously, if the issue was post-1958, loud alarms would be triggered. Still, that the paper-bond production is the same (if it is) for both texts proves nothing. The same bond would have been easy enough to match in 1966. And clean sheets of the same kind were no doubt present in the mass of papers Koch took from the apartment. That said, I’ll share here another very intriguing scenario, which I touch on in the book: That ‘A True Account . . .’ may be a mid-1950s O’Hara poem that Koch modified and “re-set” from a text he (Koch) refers to in correspondence as the “Imitation of a Russian.” O’Hara sent the poem to Koch in 1955, when the latter was living in Paris (the poem is lost; the poem that had accompanied it survives). In all probability—their mutual enthusiasms for the Russian poet were approaching a peak around this time—this lost text was an imitation of Mayakovsky. 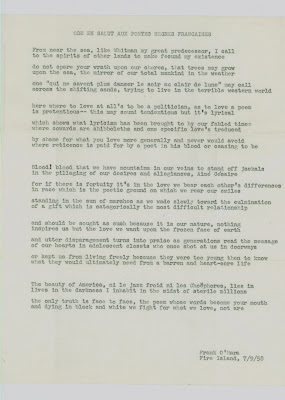 In his letter of response, Koch praises O’Hara’s “Russian futuristic breathlessness” and calls the imitation “just perfect.” One might entertain the possibility that Koch, if his hand is present in ‘A True Account . . .,’ was working from a memory of this mysterious poem—creating an imitation of an Ur-imitation, so to speak. If so, then ‘A True Account . . .’ would stand as a co-authored masterpiece, wherein, one could say, two friends become immortally conjoined. As for Fondren’s awareness of an insertion, I discuss this at some length in the book’s introduction. As I discuss above, whether or not the letter had previously been “on the market” is not a key point. There is no sequential record, it appears, of whose hands the item was in. I’m glad Towle has reproduced the texts. I’ve had copies of the letter and poems for two years now, kindly sent to me by Jaffe. Again, though, Towle is apparently unaware that the hypothetical scenario would have Koch seeing the letter (and whatever accompanied it) before the memorial reading. So his points above are, again, irrelevant. Incidentally, O’Hara was far from shy about personally signing (usually with inscription) poem manuscripts and ephemera he gave to friends. One might think it peculiar these rather special “gifts” contain no trace of his distinctive script. No, I haven’t suggested that. See my comments above explaining Towle’s poignant misapprehensions. Of course Koch would have made a carbon or two if he wrote the poem. The writing of it and the furtive placement of a carbon would have possibly (though not definitely) been roughly concurrent. Towle really should read my book and at least come to understand the basic premises of the hypothesis, which is quite open about being just that: a proposal which if untenable should be ready for falsification. In that way, he would be in a better position to offer reasonable refutations instead of immaterial retorts. On the question of Donald Allen: Here, too, if I am properly following his point, Towle seems confused. For Allen likely first encountered the poem when he was creating a retyped partial collection and bibliography of O’Hara’s letters, a task he began in the very early seventies, so far as I know. In fact, the letter to Fondren is entered by Allen, with identifying note concerning the accompanying poems, into the bibliography and copies of O’Hara’s correspondence, now stored at U. of Connecticut / Storrs. 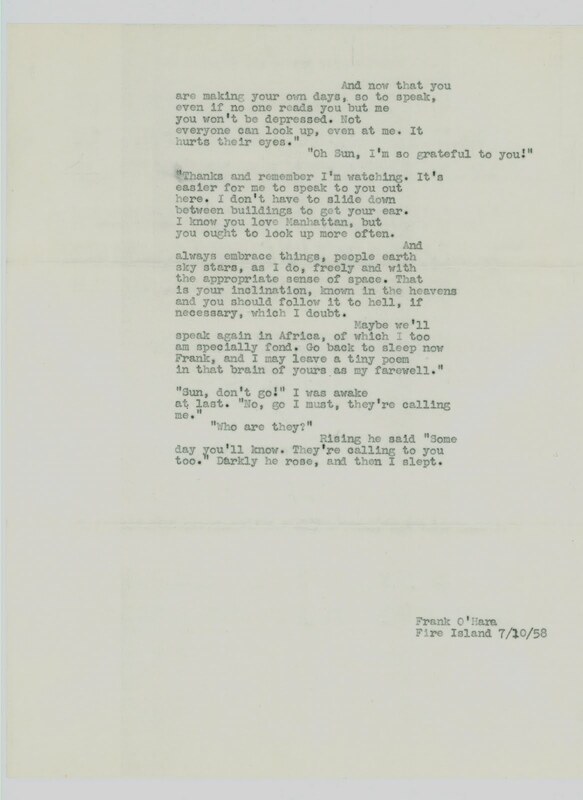 I had inquired some weeks back, as chance would have it, with someone directly involved in the curatorship of that collection, asking if it was known, in the case of the Fire Island-letter item, whether Allen was working with copies of the letter and poems originating from O’Hara’s apartment, or from the actual item of correspondence sent to Fondren. This person could not claim certainty. In either case, it doesn’t really affect the hypothesis of Koch’s authorship—though if Allen had been working with the original letter, it would mean, if the hypothesis is true, that Koch would have had to place ‘A True Account . . .’ into the envelope sometime within four or five years following O’Hara’s death. That’s why I inquired. This is, of course, the most interesting part of Towle’s letter, and I thank him for the revelation. As I said, I’ll assume the correctness of what he says until someone presents evidence to the contrary. More on this important information from Towle below . . . I think Towle means ‘Ode: Salute . . .’ where he last mentions ‘A True Account . . .’ Otherwise, I’m not sure I follow the scorn he’s directing my way. Be that as it may, once again (and my apologies for repeating this point), Towle is assuming that Koch would not have had access to the 1958 letter in the weeks following O’Hara’s death. The hypothesis assumes he did—in fact, the hypothesis rests on this scenario! So the above musings on Koch’s needing to back-edit ‘Ode: Salute . . .’ to a fabricated early version, destroying another poem in the process, and so forth, are neither here nor there. 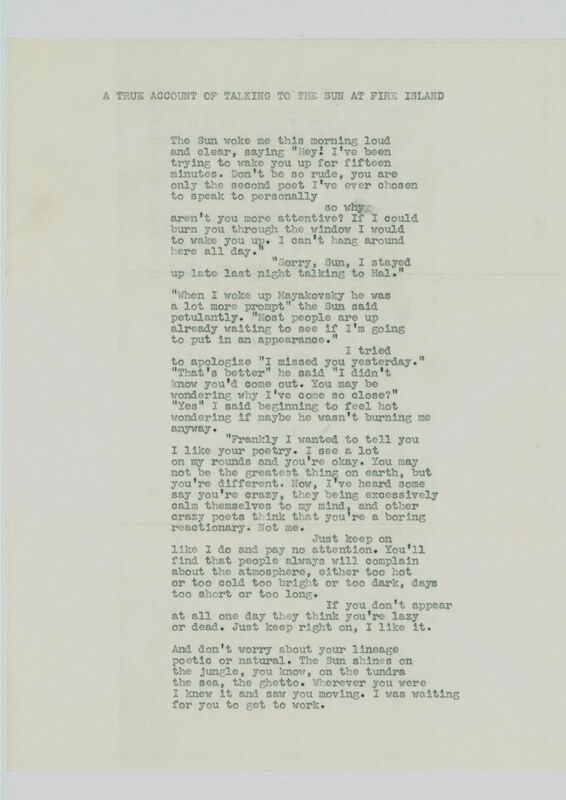 However, a new possibility in regards to that second poem is raised by Towle’s information regarding the typewriter. See below. 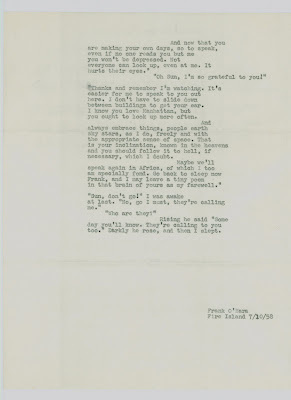 As I point out in the introduction to the forthcoming book, the available evidence makes it highly unlikely, logistically speaking, that O’Hara pounded out while at Fire Island perfect copies of “the two poems” mentioned in the letter. Assuming Towle’s previous comments about O’Hara’s portable Royal are accurate, the question leading off the previous paragraph is a very good one, so long as (from the standpoint of the Kochean hypothesis) we leave open the possibility that only one of the poems O’Hara (at least fully) wrote is actually still present with the original missive to Fondren. We might add the following questions: If by some chance Koch wrote ‘A True Account . . .,’ how did he match the typewriter on which ‘Ode: Salute . . .’ is written—something he would have needed to do to in bibliographic interests of maintaining his contextualized gift to O’Hara? We know that O’Hara was actively with Koch during the week after the Fire Island sojourn (O’Hara, quite eerily, reports in the letter that “Kenneth’s reading was very successful” and goes on to gossip about Koch, Lee [Krasner] Pollock, Patsy Southgate, May Rosenberg, and others, concerning their time together that week). Might O’Hara have told Koch during that time about his most recent poems and where he’d typed them (if he yet had)? Might O’Hara, indeed, have typed them sometime during that post-Fire Island week on a machine to which Koch had access, in some way? One that belonged to an acquaintance of them both, which Koch could have later used, or through this knowledge could have secured identical model of? Or on a machine, even, in Koch’s possession? It’s certainly not unreasonable to imagine Koch having a portable with him, at the time . . .
Really, if the poems are not typed on a machine belonging to O’Hara, one might see that Koch’s authorship becomes all the more feasible: A range of possibilities comes into play, and one is freed from being limited to the image of Koch, two full suitcases already in tow, lugging away his friend’s beloved Royal. The issue of the typewriter is now an added mystery that sparks further questions, though without getting us closer to proof either way. Nevertheless, it’s worth mentioning this: Given the absence of holographic markings on the copies (with exception of a two-dot umlaut), and given that they came from what is now a mysterious, undetermined platform, as it were (one oddly different from the source of the accompanying letter), it would be also possible to hypothesize a fresh, exact copy of ‘Ode: Salute . . .’ retyped by Koch from an original portable-Royal text by O’Hara, for purposes of creating a typographical match with his own ‘A True Account . . .’ In other words, it’s feasible that whatever accompanied the letter was also first typed, as it would normally be, on the same machine. Koch then, may have substituted both extant typescripts, faithfully transcribing the early version of ‘Ode: Salute . . .’ Granted, this is a stretch inside a long wager, but Towle’s new information brings the possibility into play. And no poem, I should say, would have been destroyed. It’s quite possible O’Hara might say something funny like that, I guess. I don’t make categorical claims that he is not the author; I’ve only advanced what I think are very unusual, even extraordinary, circumstances around the poem—ones that potentially point towards another hand and invite speculation. There is nothing wrong with speculation. Speculation is the air that poetry breathes. And I would repeat that Towle misunderstands the hypothesis in general if he believes that such an act by Koch would have implied unethical behavior. The opposite would be the case. Such a “forgery” would stand as one of the most beautiful, selfless, and idiosyncratically ethical gestures ever made in the history of American letters. It would ratify, and in singular, moving ways, both Kenneth Koch’s greatness as poet and Frank O’Hara’s greatness of spirit. Yes, the odds are still on O’Hara, so far as the poem goes, and I’d probably bet on him myself. But every so often, as we all know, the dark horse surprises. Here they come, as they say, side by side, around the turn . . .